Because the scientific resarches have showed that anaesthesia administration by a traditional syringe is unpredictable and can be dangerous for the patient. 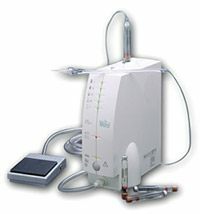 Therefore at SCS Dentima we use a computer-controlled local anaesthetic delivery system called The Wand. With The Wand the flow rate and pressure of the anaesthetic is controlled by a microprocessor. This eliminates the unpleasant feeling of the anaesthetic’s bursting into the tissue and the accompanying pain. We use anaesthetics manufactured by renowned pharmaceutical companies selected individually for particular patients, depending on their health and sensitivity to pain and on the type and the expected time of procedure. Therefore our therapy is safe and – as much as possible –painless and comfortable. It is not uncommon that during longer procedures on the dentist’s chair our patients become so relaxed and comfortable that they just fall asleep..